Hawk High belied a starting price of 33/1 to land the Fred Winter Juvenile Handicap Hurdle by three quarters of a length at Cheltenham this afternoon. The four-year-old was giving trainer Tim Easterby his first Festival winner since Barton routed the field in the Neptune Investment Management Novices' Hurdle in 1999. The victory also gave jockey Brian Hughes ample compensation following his near miss on Attaglance in yesterday's Rewards4Racing Novices' Handicap Chase. 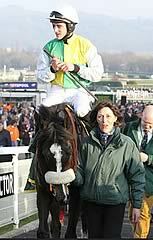 Hawk High was Hughes' first Festival winner and the northern-based jockey was in reflective mood following his success. "In some ways it makes up for yesterday and in some ways it doesn't as I should really be on two winners now," said Hughes. "It was disappointing to miss out yesterday but what happened happened and if it had come off, I'd have been the hero. It's a hard place to ride and a hard place to get a good start. All I wanted to do here was get a good start and I found myself on the inner after the horse fell and brought the other one down so I was in a good position after that. "When you have a good Flat horse like this one, they often have a chance on ground like this and he's definitely gone better on it." Owner Trevor Hemmings is used to having winners at The Festival (this was his 11th) but his joy of having a winner at Cheltenham has still not diminished and he was clearly delighted after the race. "You always hope they do well here but you never come thinking you're going to win," said Hemmings. "We sometimes have big priced winners here and Carrickboy (winner of the Byrne Group Plate) was 50/1 when he won last year. When I saw he was around 40/1, I thought he might be the one who could do the same. "The good horses that I had this week, like Many Clouds, have been unfortunate. You ask when is your luck is going to improve. We had this horse and I hoped that he would do well and he did it, so I am delighted. The jockey suited the horse and we were delighted to get Brian Hughes, who rode him very well. We knew the horse had the ability but this is a big occasion for a horse at four years of age. "I'm glad to have got the trophy as when I go to the pub, if I've not had a winner, I have to pay. I won't be paying tonight!" Trainer Tim Easterby was pleased after the race and was visibly beaming in the winner's enclosure following the race. "I'm delighted - this is the best place in the world," enthused the trainer. "We always thought he was a decent horse. He was bred by his owner and as soon as we got him as a two-year-old, I had jumping in mind for him. He is a very decent horse and he needs a confident ride. He won on heavy at Warwick but he didn't seem to handle anything right at Haydock - we don't know why." Trainer Paul Nicholls felt Katgary was an unlucky loser when going down by three-quarters of a length to Hawk High. "He was very unlucky. He nearly got brought down two out and if he'd had a clear run he probably would have won," said Nicholls. "When we bought him it was as a chaser for next year but he improved physically so we thought we'd come here. We'll find a good race somewhere before the end of the season but he's a really nice horse for the future."